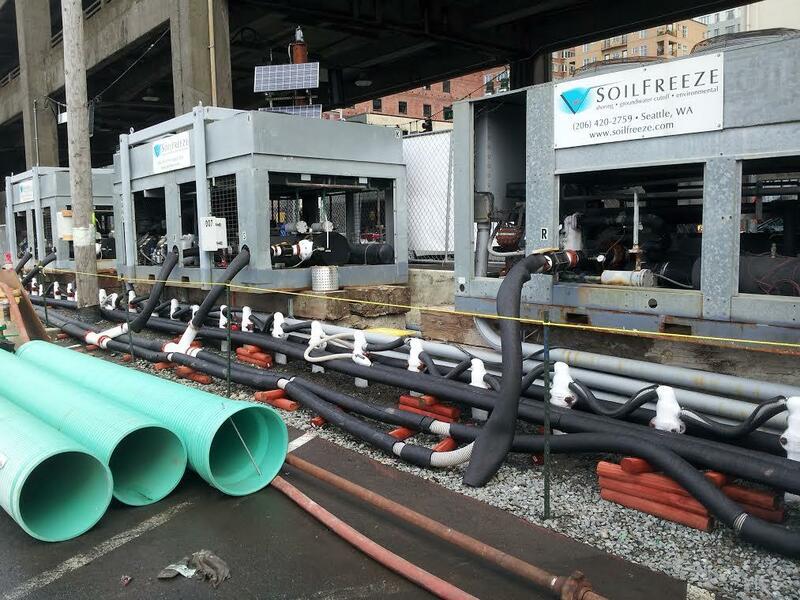 Pipes containing a cold saline soluntion freeze a worksite along Seattle's waterfront. Crews replacing the seawall have to deal with water from Elliott Bay on the west side of the wall. And on the east side, facing downtown and Pioneer Square, water seeps up from the ground. To create a dry environment on the city side, Seattle hired a company called Soil Freeze. And that’s what soil freeze does — it freezes the ground. Pipes with a super-cold saline solution coursing through them are laid in and around the construction site. They are connected to industrial refrigeration units the size of pickup trucks. “It starts freezing around each one of theses pipes we put in the ground. And eventually, each pipe freezes to the next pipe and becomes a barrier. That barrier gets thicker as the freeze continues, and it becomes a structural wall,” said Larry Applegate, president of Soil Freeze. 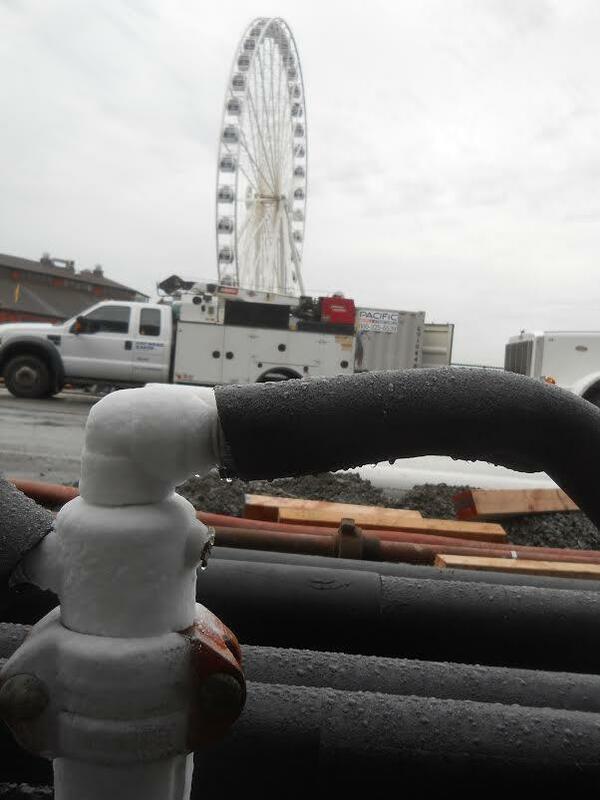 Pipes containing a cold saline solution freeze a worksite along Seattle's waterfront. With a frozen barrier, there is no need to build a retaining wall, so can workers can dig deep without worrying the ground surrounding them will collapse. It takes four to six weeks to freeze a section of earth. Jessica Murphy with the city’s Department of Transportation says freezing the soil and water means there is no need to pump water out of the site. “Once you pump it out of the ground, you have to do something with it. You have to treat it. You have to contain it, hold it, store it. It takes up a lot of space. Weighing all those risks, the pros and the cons, we did chose this soil-freezing technology," Murphy said. The $290 million seawall is about a year from completion. The subterranean structure is a vital part of the city. It shores up city blocks, keeps utility lines in place and makes it possible to have roads close to Elliott Bay. The original structure was deteriorating, partially due to gribbles, the termites of the marine world. It was built more than 80 years ago. Back then, work mostly took place during low tides. Following Puget Sound’s schedule meant the project took 20 years to finish.